The Card Caddy is designed mainly for traditional playing cards but can easily be appropriated for your favourite expandable card game deck. 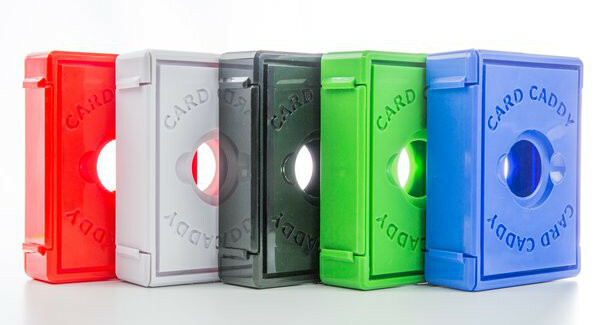 It's made up of two injection moulded shells that slot together to form a hard plastic box for your cards and there's even a little window allowing you to quickly glance at what's inside. The two halves of the shell don't just offer a protective covering but can also be slotted together in a different arrangement to form a handy holder for your draw and discard piles. It's this card carrying transformer where the Card Caddy is going to be a boon for the OCD gamer. If you are the kind of player who is constantly tidying up the discard deck into a neat little pile (while huffing or chunnering to yourself 'why can't people just keep things tidy?') then the Card Caddy is going to be your friend. In fact if you're that much of a neat freak then you'll be taking it to every board game night as well. The problem with the Card Caddy being designed mainly for traditional playing cards is that it's a little short for your typical CCG deck. Throw a deck of 60 magic cards in and the Caddy only just shuts fully. Sleeve your cards and you’re never going to get your deck to fit in. My current favourite expandable card game, Doomtown Reloaded, is based around a 52 card deck so fits in quite snugly, but that doesn't help everyone. Thankfully Narrows Hill Games are aware of this little issue, and are currently running a Kickstarter for 2 and 3 unit height Card Caddies. These are exactly the same construction but are two or three times taller, allowing you to fit larger, or sleeved, decks into the Caddy without any issues. The Card Caddy isn't going to be for everyone. It's a hard plastic case that keeps your cards sorted and protected from bumps and crushing, but the large 'observation window' means that it's not going to offer protection from spills and splashes. That being said, most keen card gamers are also to protect their cards with sleeves so it’s an issue that depends on what kind of player you are. It is the dual purpose draw and discard pile holder that is the big selling point for the card Caddy. By keeping the cards in neat little pile it means OCD gamers can give a content sigh and stay in their happy place and even if you’re not that OCD, the Card Caddy is a great way to keep your card games sorted, protected and tidy on the tabletop. This review is based on a full retail copy of the Card Caddy provided by the publisher.